Most times at Christmas I get gift sets from The Body Shop. It always smells gorgeous in there, their products are animal cruelty free and they always have some nice Christmas gift sets. Here's a few that can be stocking fillers for friends or those teenage family members. Chocomania Beautifying Oil : I'm not much of a chocolate fan albeit to common myth it may seem so. Yet this to a chocolate fan, they will probably love this. This dry oil can be used on your face, body and hair! Multi-purpose. If your wanting your hair to smell chocolatey this is your best bet. I like dry body oils personally. Run this down your legs and arms for a nice sheen to your skin - beware, if someone takes a bite out of your arm, I will not be held liable. 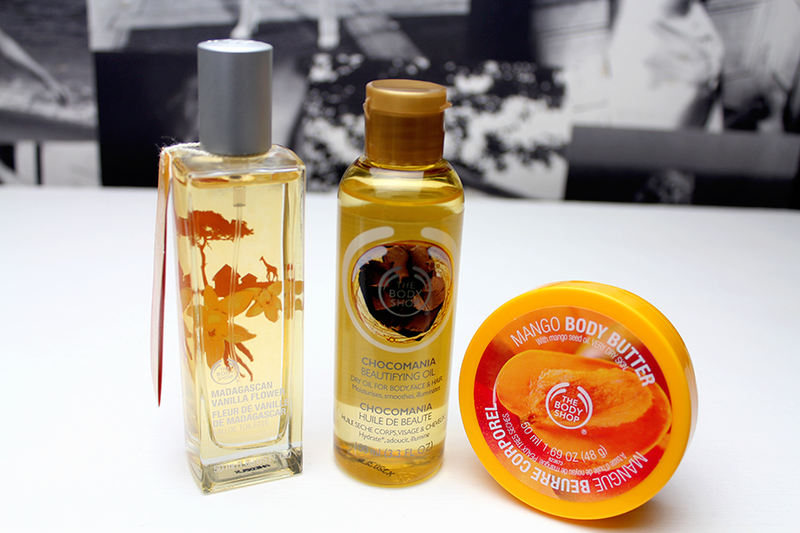 Mango Body Butter : Body Shop say this body butter should leave the skin hydrated, leaving the skin soft and smooth. Their body butters are one of my favourites, non greasy, rubs into the skin well and they always have the best smells such as exotic and fruity. During these colder months it's important to always have something that hydrates the skin without being greasy or sitting on top of the skin. Do any of these interest you for gifts or even for yourself? I have that beautifying oil but I'm not sure about it. I don't like it on my hair as it dries it out and makes my face greasy :( I'm yet to use it as a body oil... It is kind of in the back of my draw at the mo! I love vanilla scents, too! I agree - if it's vanilla, I probably already have it or it's on my wishlist! I must admit, that chocolate oil sounds pretty good to me! I've just finished a tub of the mango body butter, always a favourite.